We think our Realtors are the best in town! Call today and you'll see why! Sand `N Sea's 2014 First Six Months Real Estate Stats are in the news! Read the Galveston Daily News article 'Shift in homes: Sales, prices on the rise on island for 6 months'. Rent a Sand `N Sea Beach House! Read the Houston Chronicle article: 'Finding a family-friendly vacation rental in Galveston'. Bring your pup to the beach & stay in a Sand `N Sea vacation home! Reported in the Houston Chronicle's "Discover Galveston". Sand `N Sea's Annual Real Estate Stats are in the news! Read the Galveston Daily News article "Island home sales, prices on the rise." Celebrate in a Beach House! Read the Houston Chronicle "Sand `N Sea beach homes are sleigh-landing approved" article. Fall is a great time to stay in a Sand `N Sea Vacation Rental! Read the Houston Chronicle "Galveston Island Time" article. Sand `N Sea Vacation Rentals has had some nice publicity lately! Read the Houston Chronicle "Discover Galveston" piece. HGTV Beachfront Bargain Hunt: We have a television star in the making! 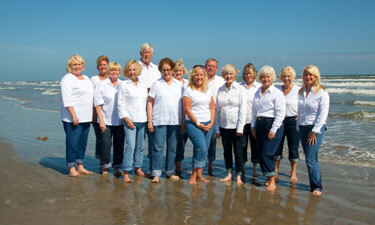 REALTOR, Carol Miller, is featured on an upcoming episode of HGTV’s Beachfront Bargain Hunt. Tune in March 15th at 7:30 p.m. CST or March 16th at 2:30 a.m. CST to watch Carol help a young couple find their dream island property. January 2015: Sand `N Sea Realtors® recently earned their Seller Representative Specialist (SRS) designations; the course was taught by Pat Strong. Left to Right, Back Row: Pat Strong, Andrea Sunseri, Madonna Morris, Cy Eilers, Barbara Zimmerman, Joanne Edge, Peter Van Borssum, Kimberly Gaido, Michael Gaido, Pamela Gabriel, Jana Turner, Wendell Odorizzi. Front Row: Amanda Ross, Alicia Martinez, Carolyn Gaido, Claire Reiswerg, Becky McClain, Carol Miller. July 2014: Sand `N Sea Realtor, Pamela Gabriel, presented at the Galveston Community Connections Mentor Luncheon. Read a blog entry by My Galveston contributor Sarah Harano. July, 2014: Sand `N Sea Realtor, Carol Miller, listed a beachfront beauty in The Dunes of West Beach, featured on The Daily News. HGTV Beachfront Bargain Hunt: Watch Sand `N Sea Realtors, Cheryl Smith and Jana Turner, find the perfect beachfront property for their clients on Beachfront Bargain Hunt! May, 2014: Stunning water views from this Crystal Beach home, listed by Sand `N Sea Realtor, Michael Gaido, featured on The Daily News. April, 2014: Check out this canal front gem, listed by Sand `N Sea Realtor, Andrea Sunseri, featured in The Daily News. March, 2014: Sand `N Sea Realtor, Pamela Gabriel, listed a beautiful beachside retreat in Pointe West, featured on The Daily News. March, 2014: Fabulous beachside property, listed by Carolyn Gaido, Sand `N Sea Realtor, featured in The Daily News. February, 2014: Sand `N Sea welcomes Realtor, Kimberly Gaido to our Real Estate Team, reported by the Galveston Daily News Announcement. February, 2014: Dream house in Laffites Cove listed by Barbara Zimmerman, Sand `N Sea Realtor, featured on The Daily News. August, 2013: Take a look at this fabulous canal front property, listed by Cheryl Smith, Sand `N Sea Realtor, featured on The Daily News. July, 2013: Check out this terrific beachfront property, listed by Sand `N Sea Realtor, Cy Eilers, featured on The Daily News. November, 2012: SNS Realtor Andrea Sunseri was quoted in a Bloomberg News piece. February 1, 2012: Amanda Ross has rejoined Sand 'N Sea Properties - we're happy to have her back! Click here for more information. February 12, 2012: Andrea Sunseri was featured in a February 12, 2012 Houston Business Journal feature on Galveston real estate. Read the article here. Galveston ranked number 2 on the 10Best Spring Break Destinations - Review the entire list. Galveston placed number 7 on the “Top 10 Destinations on the Rise in the U.S.” Review the complete list. Gull author publishes Book on Galveston Birds! Warblers, Tanagers, and Orioles, oh my! Read the most recent issue of Gulls n Herons, so you will be able to identify our feathered friends. Real estate sales, prices are on rise in Galveston. Five years after Hurricane Ike and Galveston Island is better than ever! Read the article.